Thirty years. That’s a good amount of time. Enough time to raise two children, to earn a permanent ban-and-bar letter from your local Air Force base, to survive consecutive disappointing presidencies, and to stockpile the necessary paperwork to keep an unknowing intern busy for two straight months with no end in sight. To understand my relationship with the Nuclear Resister archives, one must also understand I have never been arrested, I love stories and I am deeply saddened by the fervor of the conservative right which has diluted our faith, morals, and intelligence and is now demolishing logic and creativity. It was amidst this heartbreak, armed with my enthusiasm for stories and lacking any experience in the realm of civil disobedience that I arrived to Tucson in January to fulfill the role as a Nuclear Resister archives intern. I knew it would be a once-in-a-lifetime experience to help two deeply committed activists wade through their files of nostalgia and empowerment. A newbie to the peace movement and recent alumnus of the Los Angeles Catholic Worker, I was eager to get my grubby hands on Felice and Jack’s treasure trove of information and offer myself as an empty vessel to be filled with stories. My first assignment was a bit of an escape from the present world, which I readily welcomed. I was to scan through boxes of radical newspapers from the 1980s which Felice and Jack had saved for potential articles about nonviolent civil disobedience. As the work of the Nuclear Resister is done out of the Cohen-Joppa home, I sat at the dining room table (sometimes in my pajamas in the afternoon) and cut out the appropriate columns from the brittle newsprint. Along the way, I read about human blockades of trains carrying materials for nuclear weaponry, graffitied messages of peace on military billboards, mass actions at the Pentagon, and draft resistance. While I knew that political contention is nothing new to this millennium, I was surprised to encounter stories from the decade of my birth which resonated so deeply with my current frustrations. Upon seeing evidence of peace activists confronting the U.S. funding of foreign militias and the continued building of a nuclear arsenal, it was easy to forget I was reading about issues that had occurred at least 20 years ago. Slowly, I started to feel connected to something larger than myself, to a movement and tradition that existed before I was born, to ideas and tactics which were crafted and discussed for hours. There I was, sitting in front of a wrinkled and acidic newspaper spread, wide-eyed and intoxicated by the typewriter text. And this was just the first week. 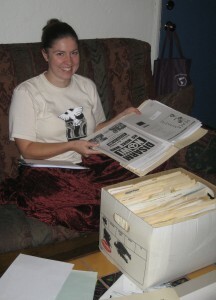 After four file boxes of newspapers and newsletters, I changed workspaces to Jack and Felice’s living room couch. During this round, my days were spent cataloging the 19 boxes of “action folders,” as the Cohen-Joppas and I call them when we’re in archive-mode. Each cardboard box is filled with folders that hold information on every nonviolent direct action chronicled in the Nuclear Resister since its beginning in 1980. The files are labeled by names of military bases (e.g. Davis-Monthan, Vandenberg), nuclear facilities (e.g. Rocky Flats, Los Alamos), activists (e.g. Carl Kabat, Helen Woodson), politicians (e.g. Sen. Obama, Sen. McCain, Sen. Clinton), civil disobedience hotspots (e.g. Washington D.C., Greenham Common), movement (e.g. Nuclear Truck Watch, River City Campaign), and by the name of the action itself (e.g. AVCO Plowshares, Tubman-Connor Disarmament, Trident Plowshares 2000) – each folder containing the story of at least one arrest. To prepare for cataloging, I would perfect my work environment with a cup of strong coffee at my side and some Democracy Now! or music in the background (a regular choice was Crosby, Stills, Nash and Young’s Déjà Vu). I began with a single file in my lap. File by file, I hunted for prisoner correspondence, fliers, original photos, statements read in court and more, and carefully noted the contents of each manila sheath. I was always determined at the beginning of the day to go through the most material possible. That dream was smashed daily. I consistently found that every file I touched was fascinating. I could pick up a file with two papers in it, and would find something to hold lustfully and read in its entirety. I stared at the pictures of limp-bodied non-cooperators being hauled away by pairs of police. My jaw dropped at the photos from Rocky Flats and White Train actions, showing rows of men and women sitting between the rails of the train tracks, refusing to give nuclear weaponry an inch. Tears welled up in my eyes when I read accounts of activists who decided that one life taken in war was too many, and brought their message of peace by risking harm to their own bodies through fasting, blockades, Plowshares actions and myriad other tactics. The activists’ passion flowed from the page and infiltrated my heart. Regular visits with the archives left me, consequently, in love with strangers. These visits also made it difficult not to feel that my life was somehow mundane, especially after reading accounts of individuals taking jackhammers to missile silos, communities vying for the closure of a nuclear plant, and throngs trespassing en masse onto the Nevada Test Site. However, the thrill of these stories was not enough to shake my hesitancies of risking arrest. Yet still somehow, despite my lingering questions regarding my own role in the world of dissent, I felt at home amongst the letters from trespassers and hammer-wielding peacemakers, and the photos of banners and protest signs. Meanwhile, the problem of conservative propaganda still permeated my life. I was in McCain country. Daily, I would read the letters to the editor and op-eds in the Tucson paper and would talk angrily back to the printed words. The newspaper became little more than snippets of proof of the demise of the ethic of equality, the rewriting of history by those who do not understand it, and the support of patriarchy as an acceptable order. I was dumbfounded by the overwhelming acceptance of lies and stupidity for a temporary ease of mind that “we” are right and “they” are wrong. But I would return to the boxes of files about men and women putting their bodies on the line – repeatedly, even – for peace. The archives exposed the purpose of the peace movement to be more than fighting back and screaming a boisterous “NO!” Each file demonstrated the aim to bring justice to those made invisible by the acts of war and the profiteering from it. I was filled with hope to learn about men and women who felt no other choice than to say, “no more!” by asking questions, taking faith as a verb, love as a mandate, peace as a reality. As I imagined putting my own body in harm’s way, being restrained in handcuffs, experiencing jail, I grew frightened again. When I’m brave enough to go into it all without fear, then I can get arrested, I thought. One letter from a woman particularly moved me. She wrote upon her release from prison, having found the world to be in the same sad condition she left it when she began her sentence. For months, she sat in deep depression, wondering the worth of her action and the effectiveness of the peace movement. But steadily, she gathered her strength and recalled her desire for peace. The same woman who once felt defeated by the continued production of war despite her efforts against it recommitted herself to the peace movement. It was through this letter and through my contact with almost 1,000 files on direct action that I was able to realize civil disobedience does not require a hero or a sort of invincible character to be praised by mortals. Civil disobedience instead demands that we live out our values, and be willing to forego some of our comforts so to illuminate and convert hearts to truth. Since I had been reading these stories of men and women as fantastic tales of courage and faithfulness beyond my own capabilities, I reflected for some time in an effort to humanize those I had revered for weeks. I thought of the Plowshares 8, Katya Komisaurak, Susan Crane, Felton Davis, Susan B. Rodriguez, John LaForge, Bonnie Urfer, Felice and Jack Cohen-Joppa, Helen Woodson, Louis Vitale, Jerry Zawada, Liz McAlister, the Gumps, the Holladay family. I hope they were all at some point in my place, feeling helpless and inadequate and lost for answers in a broken world. I hope they felt immense frustration with the world around them, and even yelled at the newspaper or television every so often because they didn’t know what else they could do. I hope there were characters like Glenn Beck that haunted their quest for peace. I hope these men and women who have taken risks for peace and who are human like me looked to other activists as I look to them – in awe, with appreciation, admiration. It was through the gift of the Nuclear Resister archives that the people I revere were able to communicate to me that, yes, the war machine is inhumanly giant in comparison to our small bodies and the voices in support of it can seem much louder than ours; and, yes, we are allowed to be afraid of the repercussions of the manmade machinery of death; but we are not allowed to sit idly by either, waiting for someone to act for us or feeling sorry for ourselves. It is within each single action that we all take one step closer to the reality of peace. Most importantly, we are supposed to do this as average people, not as heroes. We are to raise the standards for our world and tap into the truth, love and justice whose presence we can just see far off on the horizon. By the grace of the Nuclear Resister archives, this is what I have learned we are called to do. We are beckoned not just as people of peace, but as members of the human race.